Dabbing has taken cannabis culture by storm. It has led to an explosion of advanced weed technology. There is an ever-increasing number of ways to smoke weed, and many novel products worth trying. In some circles, bongs and joints are almost a thing of the past. Today’s weed enthusiasts are into dabbing. The rise in popularity of dabbing has gone hand-in-hand with the rise of the cannabis culture in general. The chicken and the egg theory is easily applied to this situation because nobody is entirely sure which came first: the dab or the surge of acceptance. Dabs may owe their popularity to a shift in preference. More and more cannabis users prefer stronger concentrations, meaning increased demand for concentrates. Over the past decade, solvent-based extraction methods suddenly became the go-to process for marijuana dispensaries around the country. This naturally led to exploration by weed smokers to find out new ways to use the concentrates. Enter the dab, and the dab rig. So What is a dab? A dab is technically an umbrella term for a wide variety of cannabis concentrates. Any form of concentrated marijuana that can is dabable is a dab. The most popular types of dabs are products like budders, shatter, oils, wax, and hash products. Dabs are a quick, hassle-free way to consume a potent hit of concentrated cannabis. While you can technically dab any cannabinoid concentrate, the most popular one is THC. By smoking a traditional joint, you get between 10 to 20 percent THC. As soon as you dab a concentrate, you are inhaling up to 90 percent THC. Many people consider a dab to be safer overall for the lungs. It basically only consists of resinous flavonoids, cannabinoids, and terpenes burning. Although dabbing is far too new to have any concrete long-term data on the subject, enthusiasts believe it’s the healthier option. If dabs are the noun, dabbing is the verb. Basically, dabbing is the physical action of smoking a concentrate. To use it in a sentence, “Dabbing is the nearly instantaneous vaporization of marijuana concentrate.” Once vaporized, by touching the concentrate to a hot surface, the vapor is inhaled. Again, dabs aren’t easily definable. Read a full detailed explanation here, but for the intent of this article, let’s review the basics of dab products. There are two main subtypes of dabs, those made with solvents and those made without. The new trend in dab technology is to create safer products with less reliance on solvents. With that said, the vast majority of dabs today are still the solvent based. Each of these substances has an entirely different method of extraction. For example, the obvious one is BHO. It relies on a butane extraction method. Kief and bubble hash rely on more of mechanical separation. Solvent or mechanical, the aim is to separate the rich trichome heads from the otherwise useless plant material. 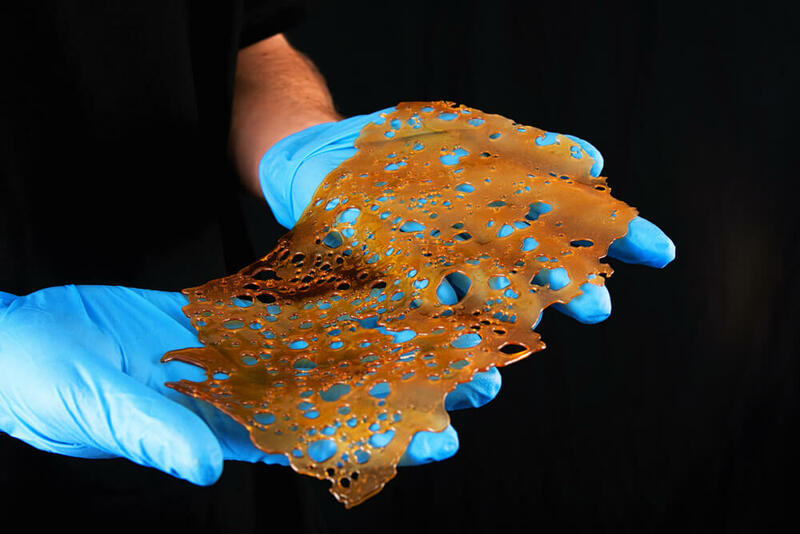 One of the next-generation solventless methods of extraction is called rosin extraction. Rosin extraction relies only on heat and extreme pressure to produce budders, oils, and shatters. Interestingly, it is safe to recreate at home with a piece of parchment paper and a hair-straightener. For those used to smoking the flower, dabbing requires a bit of upfront investment to set up a good dab rig system. A dab rig is essentially the bong used to inhale the vapor. In fact, many bongs can be upgraded with a different end piece to allow for dabbing. A dab rig requires a powerful heat source and a tool called a ‘dabber’ or a nail. The most common device is just a regular nail from the hardware store. The heat source is a small blowtorch, meant to heat up the nail to extremely high temperatures quickly. New technology is eliminating the need for a potentially dangerous blow torch, however. Now, you can use an electric nail to apply the concentrate to the bong. The final step, once the dab is placed in the receiving end of the water pipe is to cap it. This forces the cannabis vapor through the pipe and into your lungs. Although there are a thousand and one ways to accomplish this, most people have a decorative piece of artistic glassware to use for this process. Most people who dab have been around the block a few times. This is not their first rodeo. Dabbing is the natural progression from smoking a bong or a pipe. It is not the go-to for first-time users. Concentrates are much stronger than smoking straight flower and most people rely on them to provide a much more potent hit. Once you are fully dialed into dabbing, the benefits are quickly apparent. Dabbers often use dabs for medicinal applications like for the treatment of chronic pain and nausea associated with chemotherapy. Why? Because dabbing provides a quick and potent hit of the THC medicine. Other methods take much longer to deliver the medication to the acute health issue. If you have ever tried an edible, you’ll understand the need for speed sometimes. Unfortunately for the marijuana industry, dabbing has gotten a bit of a bad name. Thanks in part to nervous newscasters and clickbait news topics, dabbing is associated with explosions and toxic substances. These attention seeking reports are giving dabbing a bad rap. The vast majority of negative attention is about the production of concentrates. As mentioned earlier, most concentrates are still solvent based. And, as such, most solvent-based concentrates use hydrocarbons. To produce concentrated cannabis extraction, producers often use solvents like butane or propane. Butane and propane are extremely explosive chemicals. If misused during an ill-conceived extraction process, they could trigger a deadly explosion. Overheated machinery and large amounts of flammable substances generally don’t mix very well. The news, especially anti-cannabis media sources, have seized onto these instances to report that dabbing is potentially life-threatening. We all know the stories about meth labs exploding, and unfortunately, disreputable cannabis producers are giving the rest of the industry a similar reputation. Rest assured, some companies know what they are doing. For those that have a commercial grade laboratory, the story is much different. As long as the hydrocarbons are used respectfully, by professionals, the risk of cannabis concentrate production is greatly reduced. The risks of production don’t go into consideration for most people. But what about the actual dangers of dabbing? Unlike the possibly deadly explosions, the risks of dabbing are far less problematic. The most problematic part about dabbing is just sourcing a quality dab product. As mentioned, many extraction methods use solvents. If you buy from a disreputable source, there is a chance that the shatter or the hash contains leftover hydrocarbons. Dabbing is so new that there isn’t any reliable information on how many products are contaminated. Read the label, and demand that your concentrates demonstrate third-party lab results on any contaminants. Its true, with a safe rig and a reliable, high-quality concentrate, the only side effect of dabbing is greening out. Its still impossible to die from too much cannabis, but it is entirely possible to overdo it and have a bad time. Due to the very nature of the concentrate, it takes much less to feel the effects. Even if you are a habitual smoker, but have never dabbed, always take it slow on your first try. Dabs can hit hard and hit fast. But the speed and potency are actually why most people love dabbing above all other ingestion methods. Dabbing safely is essentially relies on using common sense. Don’t try to do any solvent based extractions at home. Despite what the internet will lead you to believe, butane extractions are still extremely dangerous for the amateur. Yes, it might too easy, but the potential for failure is possibly deadly. Just because you know someone who knows someone that makes cannabis oil, doesn’t mean they know what they are doing. Purchase only high-quality oils, from reputable producers. Safety yet, spend a little more on solventless concentrates to avoid any contamination potential. Although even the most rudimentary dab rigs are reliable and easy to master, sometimes it is just simpler to invest in better ribs. Be smart and spend a little extra money up front to get a dab rig set up that doesn’t require a blow torch. It’s still impossible to overdose on weed, but inhaling much concentrate isn’t exactly fun. If you don’t know your tolerance start off small. It hits extremely quickly, so you can easily gauge how much more to take if needed. Increase slowly to avoid greening out.